Footer is useful when you want to add more detailed information like slide number and date. We’ll guide you how to insert a footer in the below tutorial. Basically, a footer appears at the Slide Footer area on a slide. A Slide Footer area can include three placeholders: Date, Footer, and Slide Number. You can insert footer elements (date, footer text, and slide number) into these placeholders. 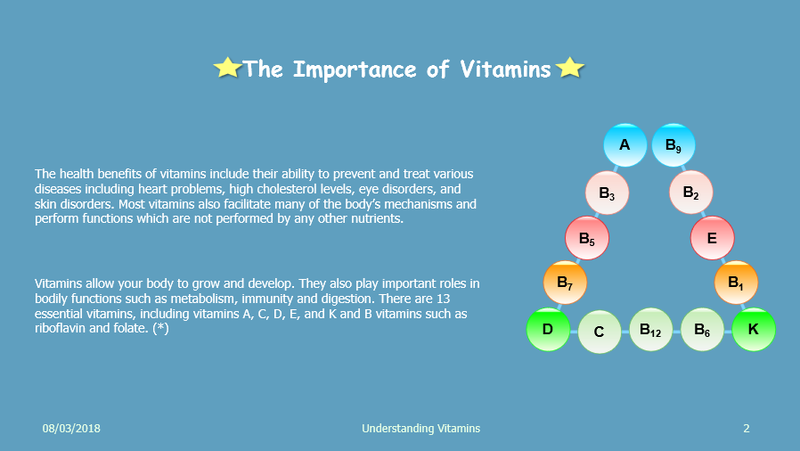 Here is an example of using a footer in a presentation. Step 2: In the Annotations tab > Footer . Then, the Slide Footer dialog appears like this. Step 3: Work with options (1, 2, 3) in the Slide Footer dialog to insert footers. These options will be described later. Step 4: (Optional) To hide date, footer text, and slide number on the title slide, select Don’t show on title slide (4). Step 5: Click Apply to save changes. If you wish to apply the changes to all slides in the current project, click Apply to All. Then, you see the Slide Footer like the below screenshot. Update Automatically: Select it if you want the date to reflect the current date each time you open or print the project. You can choose the date format from the list. Fixed: Select it to set the date to a specific date. Do this by typing the date you want to the Fixed box. After that, the date remains the same no matter when or where you edit or deliver your presentation. To add slide numbers, select Slide Number (2). For the detailed procedure, see Add Slide Numbers in ActivePresenter 7. Footer text is where to add a message, copyright, or anything you want to be visible on slides. To add a footer text, select Footer (3). Then, type your text in the Footer box. Note: If Slide Footer doesn’t appear on any slide, placeholders might be removed from specific slide layouts. To show Slide Footer again, open the Master View and select Footers in the Slide Master tab. See Using Slide Masters to learn more. 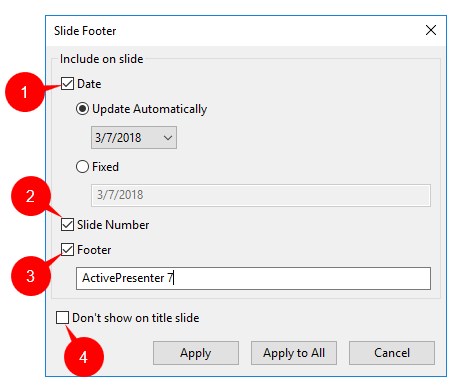 After inserting Slide Footer into slides, you can reposition, format and style footer elements on a specific slide or on multiple slides at once. To customize footer elements on a slide, apply the same steps as when you do this with a normal shape. See Inserting and Styling a Shape for more details. To customize footer elements on multiple slides at the same time, use Slide Master. Note that the changes you’ve made only affect footer elements on slides which use the same Slide Master as the selected slide. It has nothing to do with footer elements on slides which apply other Slide Masters. Click a date/footer text/slide number placeholder and press DELETE. Right-click a placeholder and select Delete. To remove Slide Footer on all slides, go to the Annotations tab > Footer. Then, deselect the Date, Slide Number, and Footer check box. Click Apply to All to finish. Step 1: Select a slide you don’t want to show slide numbers. Step 2: Go to the View tab > Slide Master . This opens the Master View. Step 3: Deselect the Footers check box in the Slide Master tab. This way deletes all footer elements on the selected slide. So, that’s how to insert a footer in ActivePresenter 7. Remember to use this technique to add footer-type information to your slide.